The first dental visit isn’t just about checking the teeth. It includes checking the lips, gums, tongue as well assessing for function of the mouth (eg mouth posture, tongue posture, swallowing etc). The approach is geared towards prevention of dental disease and oral issues. It is important to look after your child’s teeth from the moment they start teething. The best time to start the process of preventive oral and dental care is at 1 year of age or shortly after the eruption of the first baby teeth. This allows each child to become familiar with having an examination and being in the dental environment. The purpose of the dental visit for YEAR ONE AND BEYOND is to learn about your child’s oral health and how to best care for their unique needs before any problems occur. Many dental problems can be prevented or more easily treated in the early stages. It’s important to find a dentist you trust and an office where you feel comfortable. At this first visit, you will get your questions answered and start to build a relationship. We know that it can be challenging to find time to look after so many aspects of the life of a little one! 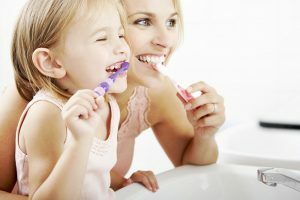 It can be difficult to know what to do when your child resists you brushing their teeth or wishes to eat the wrong foods. Parents want to be assertive and responsible about oral health without being overly obsessive – we feel the same about our clinical care. Beyond the clinical benefits, a check-up at an early age will help establish a positive attitude toward dental care. We want to make the dental experience a pleasant and routine part of growing up. We want to make Enhance your dental home and watch the progress of your child and be a part of ensuring their best path to optimum oral development. For the families of young ones who have visited us early in life (such as treatment of tongue/lip ties), it is even more relevant to track the progress of oral function. Regardless of the age at frenectomy, we need to establish a path for tracking progress with respect to critical oral functions. At the same visit, we will also do a routine dental examination. THE BENEFITS OF COMPREHENSIVE CARE FOR YOUNG CHILDREN? After this first visit, we will suggest a schedule of continuing care visits. The schedule may vary according to each child’s needs and risks. As your child grows, the dental team can help you learn how to prevent common oral problems and how to manage any issues that arise with balance. It is not unusual that young toddlers fuss during parts or all of their visit. However, you may be surprised at how accepting toddlers can be when they are being examined. They may enjoy the attention and novelty of the visit. If possible, ask another adult to come with you. It’s best if this is someone who helps to care for your child. You want to be free to talk comfortably with the dentist or hygienist and to focus attention on your child. For this reason, it is best not to bring other children along at this first visit. Bring an extra nappy and snack for your child. Also bring a favourite toy, blanket or other familiar object. This will help your child to know that the dental office is a comfortable and safe place. Parents often try to help by preparing their children for dental visits but at times inadvertently instil fear and dread into the child’s mind by using language or concepts that are unhelpful. “I want you to be brave”. This implies there is something difficult to fear and to be brave for – no need to do this. “It wont hurt!” – All they hear is the word ‘hurt’. We may lose their cooperation. “You have to be good or you won’t get a prize” Negative implication and a bribe. Remember children are very perceptive and will pick up on your anxiety. Relax, we’ll take good care of your precious ones! Your child will meet and be examined by one of our Oral Health Therapists (OHTs) or dentists. We will go through your history with you as well as thoroughly examine your child’s mouth in the knee-to-knee position. Your child sits on your lap, facing you. You then lay your child back with their head in the dentist or OHT’s lap. The dentist or Oral Health Therapist may also clean your child’s teeth. This is likely to occur if your child’s teeth have a stain that sometimes appears in infants or toddlers. You’ve taken the important step of giving your child the best start in life, but did you know oral health runs in the family and that dental decay is contagious? The bacteria from active dental decay spreads easily between members of a family and especially between parents and children – so one of the best ways to care for your child’s teeth is to care for your own. Just as we work hard to take great care of your child, we’d love to be able to take care of you too. If you’re not under the regular care of a dentist, or if you’re looking for a change, consider arranging a comprehensive examination for the adults and older children in the family. We’d love to take care of all of you!